Satellite Constellations: Too Much of a Good Thing? LEO constellations, theoretically, benefit from economies of scale which, in simple terms, is the cost saving associated with the increased level of production. The advantages come in the form of discounts for bulk orders and higher production volume as a result of specialized resources - human and otherwise, to name a few. While the benefits from standardized production have been well substantiated, it is crucial to recognize the point where the variable costs start to outweigh the fixed cost benefits, and the cost save turns into cost disadvantages, also known as diseconomies of scale. Mass production, a term conceived by the automotive industry, implies continuous production of large amounts of standardized products, to help lower the cost per unit. With the move from custom designed satellites to standardized, ‘small’ satellite constellations, mass production and associated economies of scale concepts have become quite pertinent in the satellite industry. OneWeb with its multi-assembly line factory is expected to be the first of its kind to incorporate the benefits of economies of scale, advertising production of 21 satellites/week. The cost save associated with economies of scale becomes a significant factor to consider for business case analysis of such constellations, and NSR’s Satellite Constellation: A Critical Assessment report takes these into account. 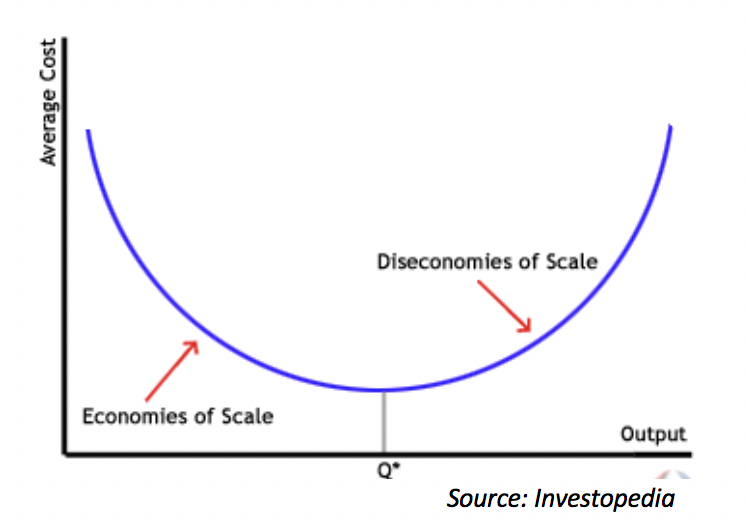 Despite the clear benefits of mass production, it should be noted that according to economic principals, an increase in production past a certain stage leads to diseconomies of scale, at both, the external industry level as well as the internal company level as per the chart below (where Q* is the quantity of units produced). While it’s hard to predict the exact number of satellites that would force the trend to shift adversely and equally hard to quantify the impact of associated diseconomies, the case of LEO constellations can be examined in terms of internal and external dis-economies of scale. With OneWeb’s 900-satellite constellation, including constant replenishment requirements, the production numbers are unprecedented in the industry, and SpaceX’s Starlink takes it to a whole new level with its proposed 12,000-satellite constellation. But with increase in production comes increase in operational, management and supply chain complexities. As such, keeping the efficiency of the work force as well as the quality of the final products consistently high can be a serious challenge, leading to process inefficiencies and - more often than not - delays in production and launch. This can further create or raise the need for higher external finances with the cost of those finances adding to the overall system costs for the operators. What starts off as competitive advantage, offering disproportionate increase in cost savings, can swiftly turn into disproportionate increase in costs. The satellite manufacturing industry is quite modest in size and with relatively high barriers to entry, limited number of contractors and suppliers with the required expertise and proficiency, it is encumbered with lower tiers in the supply chain that are more specialized. To support the production of satellite constellations - keeping in mind the growing number and size of these - will most definitely result in bottlenecks within the industry with further increase in internal diseconomies of scale for operators as well as for the suppliers. This trend is already being experienced with launch bottlenecks causing delays for small satellite operators. The rate of demand for launchers is disproportionally higher than the rate of supply and is not likely to change in the near future, especially assuming success of all or most proposed satellite constellations. NSR’s Satellite Constellations: A Critical Assessment report compares ROIs for SpaceX’s Starlink constellation for two different cases: One assumes a constellation of 900 satellites based on SpaceX’s announcement of starting service of Starlink with 800 to 900 satellites and the other case assumes 4,425 satellites based on the approved FCC filings. In addition to the points raised earlier in terms of financial cost and other complexities, another big factor considered here is the bandwidth capacity. The usable capacity for the Starlink constellation is expected to increase proportionally with the increases in number of satellites - to a point. Beyond that, the increase becomes disproportionate because of factors including higher unused capacity over the oceans and higher frequency interferences. 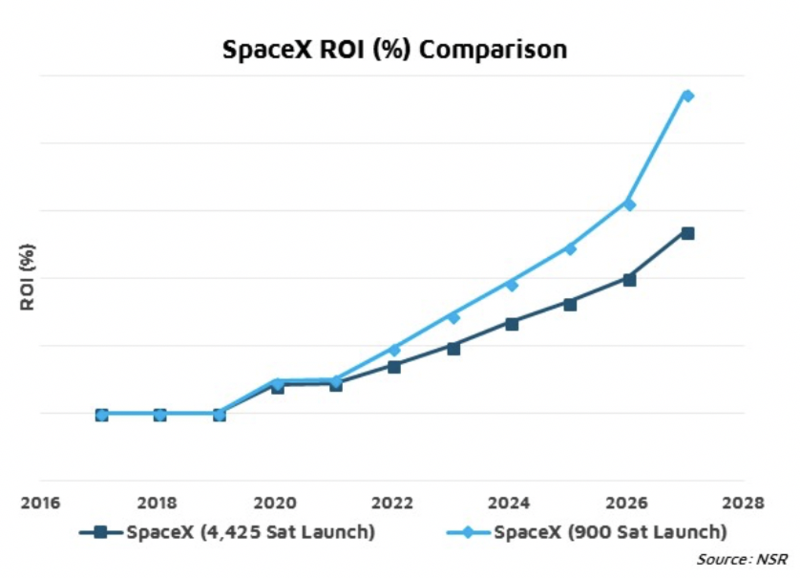 At a certain point, the additional satellites for the larger constellation continue to increase the costs but are unable to produce revenues at the same rate, resulting in a lower ROI for the 4,425-satellite constellation. Change is essential for the growth of any industry. The latest trends including small satellites or “Cubesats” and LEO constellations are opening the industry up to opportunities and revenues streams, some of which do not yet exist and production practices, that are quite radical for this industry. While the production rates of satellites may never compete with those in the automotive industry, a customized version of it is certainly being adopted by the satellite industry for the undisputable benefits of economies of scale. However, the trick to exploiting the most benefits from standardized production would to realize the limitations of the organization and its supply chain to establish the optimum quantity that can be supported. “Too much of anything is bad” is an idiom that holds true for just about anything, and when it comes to production of satellite constellations, it can have a significant economic impact, on an organization as well as the industry.